The DISC conference will be held at Université Pierre & Marie Curie at Amphi Durand in the building Esclangon, Campus de Jussieu, 4 place Jussieu, 75005 Paris. Workshop DGDC (30th September) is located in room 25-26/105 (that is, first floor from Tower 26, corridor 26-25, room 105). 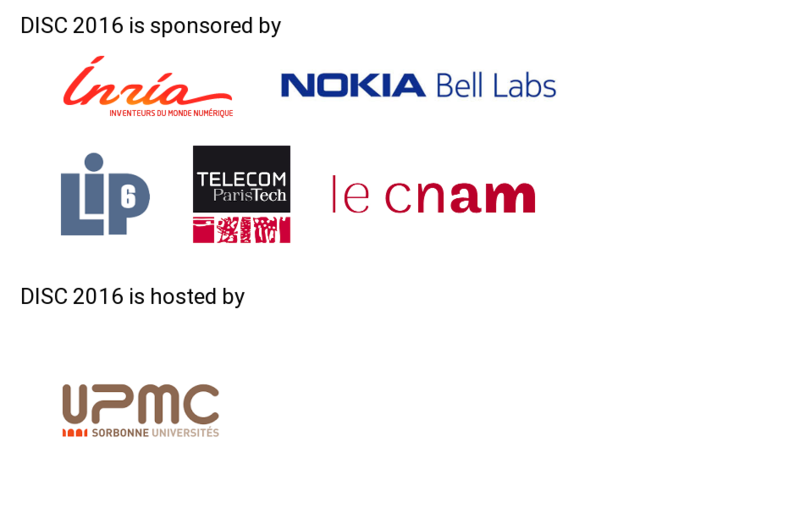 The DISC Welcome Reception will be held at Université Pierre & Marie Curie at 24th floor of the Zamansky Tower, Campus de Jussieu, 4 place Jussieu, 75005 Paris. Held in Esclangon building, Amphi Durand in University Pierre & Marie Curie (Jussieu Campus).